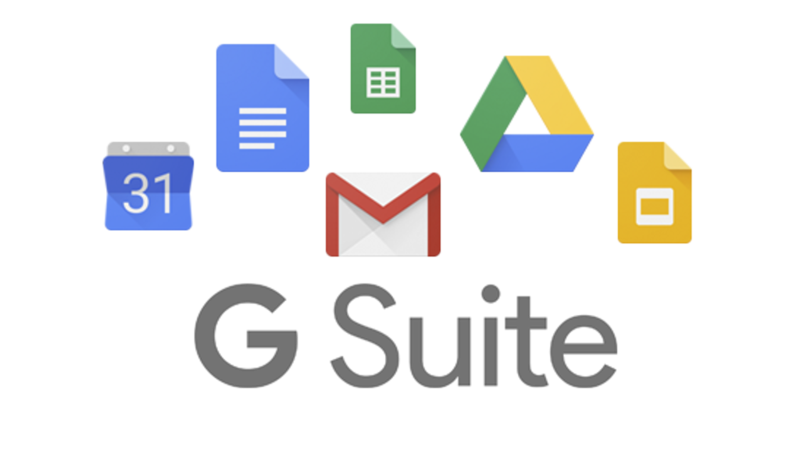 Home Tags Posts tagged with "multimedia text sets"
Ready to make G Suite-powered learning a reality in your district’s classrooms? It’s easy to start with a how-to about the G Suite tools. 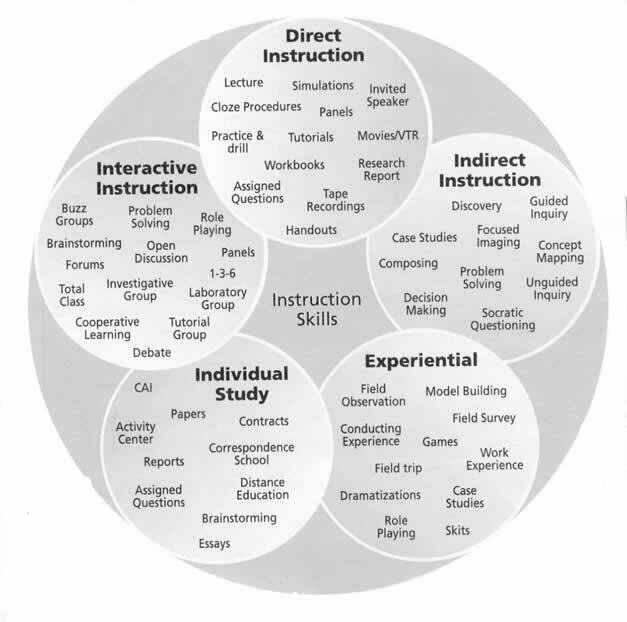 What if you could introduce them to inquiry-based learning as they learn the how-to? 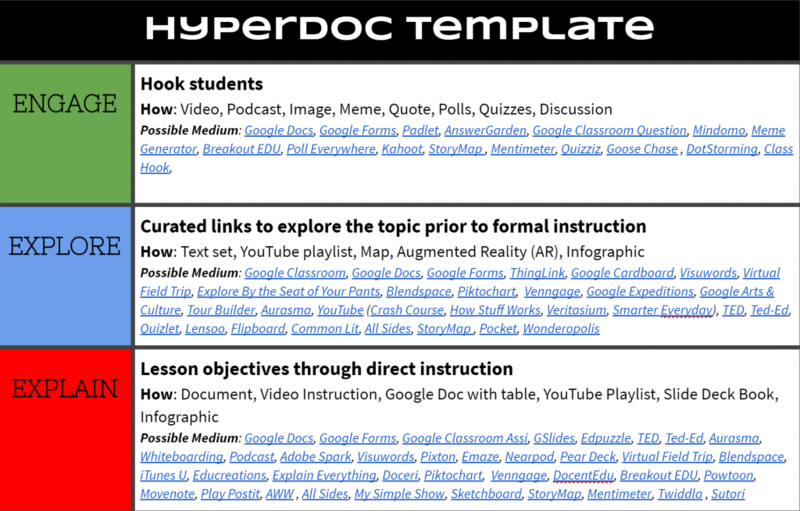 One approach that works is the use of hyperdocs. In my workshop session, G Suite Powered Learning, here are some activities I rely on to introduce teachers to ideas. After ten minutes of introducing Google Classroom, teachers often look for a way to explore it on their own. One way to focus their efforts involves using a multimedia text set, like the one below. The following MMTS was adapted from one a colleague shared with me. In using this activity with teachers, I have found them captivated. Some educators may prefer a more lengthy activity set. This hyperdoc quest has multiple phases. 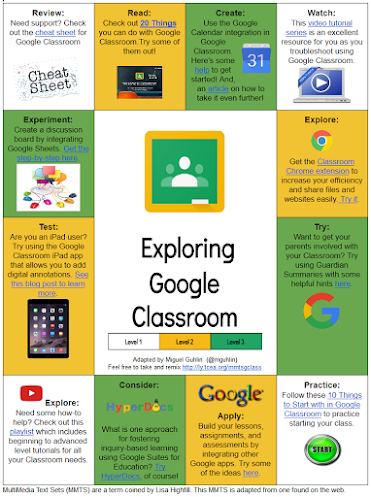 Each phase allows educators to plan their use of Google Suites tools in their classroom. Phase 1: Introduce student to an intro video of Google Classroom. After watching it, they formulate a question as to how they would use Google Classroom in their situation. With a partner, participants discuss their answer. Phase 2: In this phase, participants explore resources from the amazing Alice Keeler. Participants are challenged to find other resources that showcase the use of Google Classroom. Phase 3: Participants view different sections of Google Classroom. Each participant shares how he uses Google Classroom, or how he has seen other teachers using it. They discuss their concerns about Google Classroom while a mentor provides solutions/suggestions as needed to problems. The mentor also discusses the basics of getting Classroom up and running. Explore additional phases in the linked hyperdoc (click the link to get your own copy of the hyperdoc). In this set of activities, participants explore how Google Sheets add-ons can make email merges a cinch, as well as many other exciting possibilities. FormMule – Allows you to quickly add create information in Google Sheets, then “email merge” it together. Yet Another Mail Merge – Allows you to quickly “spam” or bulk email people. Styles: This add-on allows you to customize the look and feel of your spreadsheet, adding headers, coloring rows in alternating colors (e.g. row 1 is grey, row 2 is white, row 3 is grey, row 4 is white, and so on). QR Code Generator: This is an easy way to generate QR codes for students or to inventory items. This add-on also makes it easy to create a text label for each QR code generated so you are not left guessing as to what you are looking at, or trying to scan it with your smartphone’s cross-platform (e.g. Android, iOS, Blackberry) Inigma QR Code Reader app. Split Names: This is an absolute must-have add-on. Although you can use complex formulas to split names (e.g. “Juan Guhlin” to “Juan” and “Guhlin” in different columns), Split Names makes it a cinch. You are also able to separate out salutations and other elements commonly included. PowerTools: This particular add-on has so much to offer, you probably will want to read the website for it. Some of its best features include making the process of dealing with extra spaces, formulas and data in the wrong format, inserting or deleting cells and shifting adjacent data, changing case, or swapping values easier. Find more online at my Google Sheets Magic page. These are only three activities of all of those available. There are many more that introduce teachers, and students, to G Suite Powered Learning. Remember to have fun when using or redesigning these for your own use. Texas public school districts have free access to an expensive design program known as SketchUp Pro (and the companion browser-based alternative, MySketchUp) through TCEA. 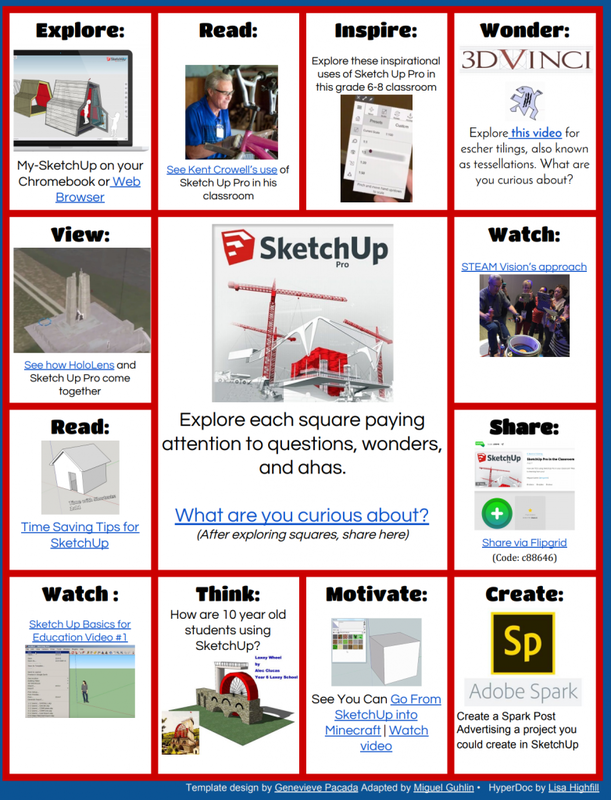 As schools start the school year, you may be looking for ways to introduce students and staff to SketchUp Pro. Why not use this multimedia text set (MMTS) to get you started? You can view the online, click-friendly version or get a copy you can customize. Login in to your Google account. Click on this link Sketch Up Pro Multimedia Text Set (MMTS). That’s it! You’ll have your own copy. Wait, you want the Adobe PDF version? Find it here, along with the Microsoft Word version. With a Google account, you can do the interior design work using the newly-released My.SketchUp.com. And if you want the full power of SketchUp Pro (a $695 value), fill out a short form through TCEA. Private schools can obtain SketchUp Pro EDU licenses for as low as $15 per seat per year. Available for Mac and Windows computers, SketchUp Pro now comes as a web version usable on Chromebooks. What’s more, SketchUp Mobile Viewer ($13.99) allows SketchUp models to be viewed on the iPad. As my colleague put it, “SketchUp is 3D modeling software that lets you create anything you can imagine. It’s powerful enough to build complex projects, yet is easy to learn and use.” Their work appears in SketchUp’s 3D Warehouse, which houses millions of models. Simple enough to use that grade 3 through adult learners rely on SketchUp for a variety of tasks. SketchUp can be integrated into a wide variety of classes.